Founded in 1968, Freight & Salvage is one of the most venerable music-preservation institutions West of the Mississippi. The organization has grown immensely from its early roots, and in 2006 the Freight commissioned a new facility to expand its audience and enhance its capabilities and amenities. The new theater provides an example of how a creative reuse of material can drastically reduce the environmental footprint of a building. The major challenge in designing a new home for an established arts institution is to modernize the facility while staying true to the organization’s culture and to its original home which shaped it. The heritage music industry often struggles with the happenstance of a new building unintentionally sanitizing the art. 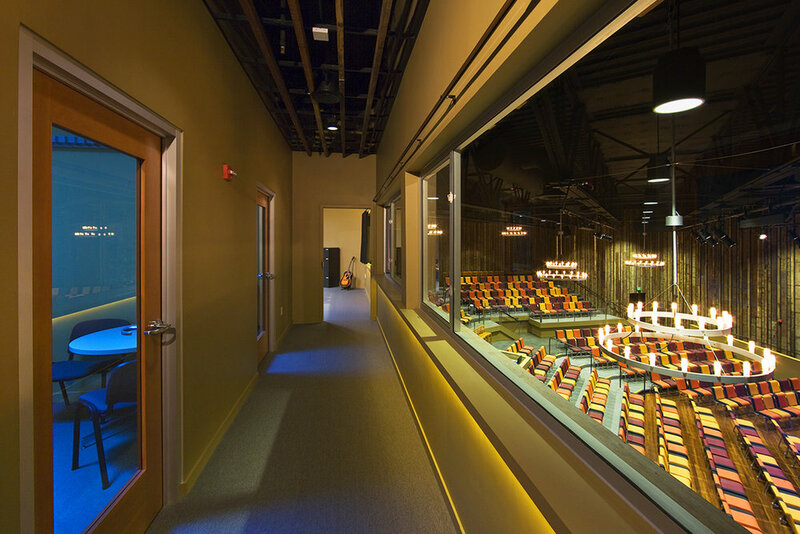 The goal for the new Freight & Salvage was to provide a modernized and spacious facility, while honestly capturing the theatre’s timeless authenticity as a home for traditional music. The success of the project hinges on its ability to give the time-honored institution a modernized, environmentally sound home that stays true to its roots in community organization and the counterculture of the late sixties. The sustainable approach to the building is both substantive and highly visible. Budgeted and designed for LEED-Gold Certification, the facility has the first “green/living roof” ever built in Berkeley. The building not only salvages trusses and wood from the site’s deconstructed auto repair garages, but it also preserves a renovated 20-foot deep façade section of the old auto-shop, which is not only sustainable in reducing waste, but also provides finish materials that are reminiscent of the old Freight. The theatre design -- layout, circulation, seating flexibility, and stage proximity -- is configured to create a singular music experience that is engaging and natural. The custom designed chairs can be arranged in multiple formats with and without tables, when necessary and in a way that patrons have outstanding lines of sight and are comfortable for the entire durations of shows. The theatre’s flexibility is exceptional -- one can arrange seating to create appropriate environments for as few as 250 people, 450 persons in the default auditorium like setting, or as many as 600 plus with standing room. A world-class A/V system, abetted by the incredible acoustics of the absorptive wood wall system, means the audience catches every note and word of the performers. These cutting-edge upgrades are coupled with salvaged or carefully-specified materials that preserve the vintage and home-like atmosphere of the theatre’s previous venue. 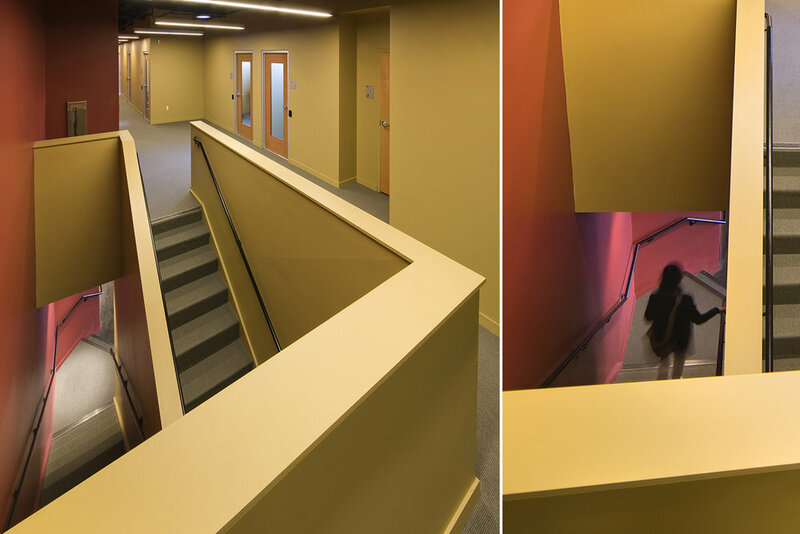 Acoustic upgrades allowed the reuse of the old Douglas Fir as wall slats in the auditorium, and house chandeliers were chosen for their contemporary simplicity, historic relevance, and compatibility with the wood walls. These features work together to create a comfortable performance venue that feels more like a living room than a concert hall.